Leroy Vinnegar, bass; Stan Levey, drums. Surprises of the kind represented by this album are as rare as they are welcome. 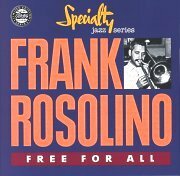 The appearance of a hitherto undocumented album by Frank Rosolino makes a valuable addition to the discographical annals of an artist whose memory is cherished by admirers around the world. The existence of the present volume was unknown except to those who had taken part in it--and, particularly, the man who produced it, David Axelrod. "Frank and I were excited about this album," Axelrod recalls, "because it was going to be the first hard bop album recorded and released on the West Coast. We wanted to get away from that bland, stereotyped West Coast image. We worked for weeks on planning the personnel and the songs; the results were terrific. It was a great disappointment to us both that the record, for reasons we never understood, wasn't released." Typical of Frank Rosolino's ingenuity is the opening cut; he tackled "Love For Sale" in 6/4, moving into a fast 4/4 for the bridge. His own solo and Harold Land's establish immediately that this is a tough, no-holds-barred blowing session. "Twilight" is a beguilingly pensive example of Victor Feldman's talent as a composer. There is no improvisation here until the solo by Land, who also plays under Frank's eloquent excursion. Frank deals with the melody, while Harold offers appropriate fills on Henry Nemo's "Don't Take Your Love From Me." Note the easy moderato beat sustained behind Frank's solo, the typically inventive Land outing, and Feldman's evolution from single note lines to chords. "Chrisdee," [mp3] an original by Stan Levey, was named for his sons Chris and Dee and is a bebop line based on a cycle of fifths, with a somewhat Monk-ish bridge. After Frank and Harold have adroitly negotiated the changes, there is a series of fours, with Leroy Vinnegar walking a passage and Stan in a couple of brief solo statements. "Stardust" is Rosolino throughout, a masterful example of his approach to a well-worn standard into which he breathes new life. The verse is played slowly, the tempo picks up a bit for the chorus, and the beat is later doubled, with Frank's sinuous lines growing busier before he closes it out on the dominant. Frank composed the album's title tune, a funky blues that offers 24-bars to Leroy, four choruses to Frank, three to Harold and two to Victor before the theme returns, ending with a suddenness that was typical of the hard bop era. Frank worked out the routine on "No Greater Love," an Isham Jones standard that dates back to 1936 and is as much in use as ever at jam sessions a half-century after its debut. The unison horns kick it off at a bright pace; after Harold's and Frank's solos, Victor gets into a single-note bop bag. Finally, Frank's own "Sneakyoso" provides the quintet with an ingenious vehicle, its attractive changes providing good opportunities for Frank to work out. Note the fine comping Victor funishes for Harold Land before taking over for his own solo. The two horns engage in an exchange with Stan Levey before the head returns. All in all, this is a superior, even superlative example of the genre of music it represents. Frank was right to be so proud of it. Sadly, Frank did not survive to see its release. Certainly it could not be said that Frank Rosolino was in obscurity or forgotten. Free For All is a very welcome reminder of an exceptionally gifted artist who left us much too soon.